MetaChat - HAPPY BIRTHDAY TO ELSA AND MIKO!!!!!!! 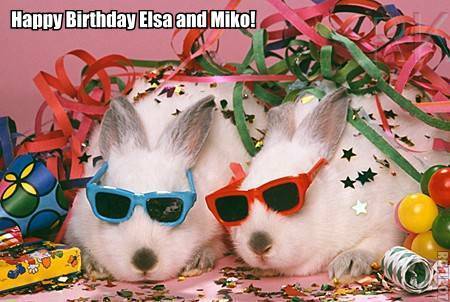 HAPPY BIRTHDAY TO ELSA AND MIKO!!!!!!! Yay! Happy birthdays to two wonderful people. Happy birthday, Miko! And happy birthday, sueinnyc! 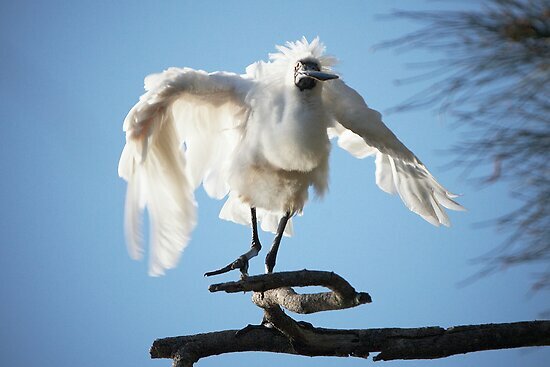 WHOOOOOO HOOOOOOO! Happy birthday to you both! champagne! This is the year .. the best is yet to come! Happy birthday! Happy birthday! Have WONDERFUL celebrations! Thanks, everyone! What a very nice day I had. First of all, I am typing this on a NEW LAPTOP! We've been sharing a laptop, but with two writers in the house, sharing was really confining. The Fella wanted to treat me to a new laptop so I could get more writing done; I thought we should both chip in so he could have a nicer, newer laptop for his ever-expanding freelancing gigs*. Then OF COURSE we had an unexpected car-mergency that cost juuuuust about what a laptop does. *Did I tell you he's writing for The A.V. Club? BIG TIME, y'all! ... but this morning he presented me with a shiny new Macbook Air all my own, bought not from a shared fund but from his rainy-day fund. AMAZING. He's so proud to have surprised me, and I'm so grateful --- not just for the indulgence, but for the gesture: he really believes in me as a writer. That's a gift in itself. The Fella worked tonight (he got an extra day off over the weekend so we could throw an early birthday party) so I got to spend the evening at my mother's where my sister, BIL, and their three kids just arrived for a summer visit. So good to see everyone! So much hugging! So much giggling! Some lovely pressies, a gorgeous chocolate cake (with lavish sprinkles courtesy of the kids), and then more hugging! That was all spur of the moment. Tomorrow night I'll go back out and we'll have my mother's planned celebration: lobster dinner for 10. I'm bringing the garlic bread. Thanks, everybody! I had a really nice day. Breakfast at my favorite bakery/coffee place with LT, a decently nonstressful work day (the internet was down almost all day which was oddly peaceful) and dinner at a great, out-of-the-way, local seasonal restaurant on Cape Ann. Then a couple special nightcap cocktails back near home. Lovely! You know, I usually just say happy birthday, but what delightful birthdays! Happy belated to two awesome ladies! Happy birthday, Elsa and Miko!